On a recent trip Laticrete’s training center in Bethany, CT a large group of the Century Tile team attended what is called a “PTK” seminar. This is a super intensive training course about Laticrete materials. What is neat about this event is a portion of the time is devoted to “hands on” learning. Why are we telling you this? We pride ourselves on having the most knowledgeable team in order to serve you better. When we say our people are trained, that includes more then the lecture and textbook stuff. This means they have actually had an opportunity to use and install the products Laticrete sells us. We feel that it is much easier to talk from experience, because you can draw on what you learned. We take the time to do things like this so we can help you by relating on a different level. Another plus is Laticrete gets to hear first hand some of the challenges we hear about; problems you may have had while attempting a tile installation. The experts are there to provide the answers or develop a new product. It is a big “think tank”….all designed to help you. Feel free to come in and test us. We’d love to wow you with our knowledge! LATICRETE is excited to present a new grout color palette for 2011! After extensive research ranging from industry trends and competitive analysis to customer feedback, LATICRETE will be replacing six colors in the existing palette with fresh shades of color ranging from earth tones to grey. They are bringing fresh, new colors to choose from because they understand trends change in both tile and grout. Beginning January 1, 2011, the following six new colors will be available in LATICRETE® SpectraLOCK® PRO Grout*, LATICRETE SpectraLOCK 2000 IG, LATICRETE PermaColor™ Grout, and LATICRETE Premium Acrylic Caulk. They will not be available in LATICRETE 1500 Sanded Grout and LATICRETE 1600 Unsanded Grout. Tell your friends you heard it hear first! What’s new with Century Tile? First and most exciting, we have the first woman store manager in the history of the company. Christina (aka Christy) Carlson is a long time Century employee who began with us over 18 years ago. She is a graduate of Illinois State University and has extensive training in a wide breath of products. More importantly she understands the installation process and can put it in terms that anyone can understand. Prior to being awarded the manager position she worked as an assistant manager at our Mt. Prospect store since 2005. She was a star performer there and was recognized in our half million and three quarter million sales club. More recently she gained CCTS ( Certified Ceramic Tile Salesperson) and is qualified in CAD architectural renderings. What she brings to the table is the female perspective of design and construction. She can help you with the commercial project as well as finding the perfect material for a bathroom or kitchen. Visit Christina or give her a call at 630-637-1600. As you may know, we have had a tremendous amount of rain in our area. Many rivers, lakes and waterways have caused flooding conditions. Basements are like swimming pools. We are all just sick over the flooding that has occurred. We spoke to a woman last week who is saddened by the loss of many of her personal items….things that she can’t replace. We want you to know that we are here to help make the replacement process for flooded floors as painless as possible. On the bright side of things there are materials that can weather these unexpected conditions. Ceramic is a great solution. It durable, easy to clean and can withstand huge amounts of water, especially when installed on concrete. Ceramic floors can look like wood, marble and even granite. Consideration should strongly be given to ceramic as a replacement alternative, especially in those homes that are prone to water issues. Century Tile has new patterns arriving everyday and are ready to help with your replacement challenges. We have a special promo that we want to share with you that is now running in all12 Century stores on Pergo Laminate. From now through Sept. 30th 2010 you can save an extra 25% on any Pergo Accolade product. We have 12 patterns to choose from and 3 specials….a total of 15 products. This is an unadvertised special, but we want our blog readers to have the advantage of being in the know. Floating floor with premium attached back making for easy installation for the weekend warrior. Available in a wide range of beautiful, realistic styles and colors. Glueless click joint installation method… Have you seen the old commercial where a girl is talking to her girlfriend on the phone and by the time her conversation is over she had installed the floor? It’s that easy…..especially because of the attached back! Provides warmth and beauty at an affordable price ….Now 25% off. 25 year warranty against stains, fading, and water damage. LusterGard Plus….provides exceptional protection against scuffs and scratches. We will feature this in our next sale campaign called “Back to School” later in August. Stay tuned for more details! Click here to locate a Century Tile location in your area. You may already be aware of our Virtual Room Designer Tool on our website, but you may not be aware that you can actually upload a photo of a room in your home and use it in the virtual room designer to try on different floors and walls. Click on any room type to get started or click on design your room to upload your own photo. Upload a photo of your room and within 48 hours (allow more over a weekend or holiday) after we process your image you will be able to see how different floor coverings and paint colors can make your room look new again! **The Design a Room service offers one complimentary room upload to our web visitors. There may be a charge for additional room upload requests. Keep in mind that you can “play” in as many room scenes as you want by choosing the first option at the top of the page. Try on different walls, floors, installation directions and save them to your workbook so you can share with your friends! Be careful though, it can be addicting! Do you want a kitchen that disappears into the background, or would you like to create that “wow” factor? The kitchen is generally the most expensive room in the house, so it’s worth the time it takes to design a space that gets noticed. Contrast provides one of the easiest ways to make a kitchen pop. Kitchens that primarily feature only light tones or dark tones are one-note spaces. Nothing stands out. 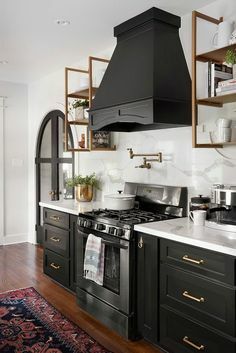 But if you take a kitchen with light cabinets and flooring and add a dark countertop and, say, some lively glass tiles as a backsplash, you suddenly have a kitchen that grabs attention. 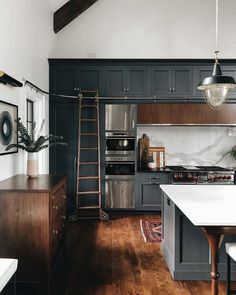 A kitchen featuring only dark tones not only doesn’t shine, it pulls light out of a room. Even a space with generous windows will feel like a cave. There’s drama in the dark tones, but they need light elements to take advantage of the contrast to create impact. Think about a light tile or stone floor and a light to mid-tone backsplash to brighten the space and allow those dark cabinets to shine. Whatever your tone preferences, take a leap to the other tone side for some of your selections and you will create a kitchen that wows. Donald Trump’s buildings are seen as the height of luxury, and recently HGTV’s Design Star featured one of his company’s newest condos. Participants were asked to create a luxurious model to sell the condos. Does your home feel as luxurious as you want it to? If not, here are some tips to add luxury to your space. Is your flooring luxurious? Dark woods, thick carpeting, rich stone tiles all create a sense of drama and wealth. If your floor doesn’t feel luxurious enough for your goals, consider a number of rich think rugs. Whether you’re considering a variety of orientals in complementary colors or a combination of contemporary rugs, the goal is to layer textures and colors to create a sense of abundance. Fabrics are a critical touch if you want a space to feel sumptuous. How about layering curtains? Start with a set of sheers to let in the light, then an extra set of panels or even two on the sides for effect. Dupioni silk combines a depth of color with interesting texture thanks to the fabric’s uneven weave. Combine a medium neutral silk with dark velvet curtain panels – both available ready-made – and the contrast of color and texture give your space an immediate luxury boost. Don’t forget accessories. A bit of bling in your space spells richness. Metallics, mirrors, crystal all add a sense of luxury. You may have just what you need with those family heirlooms packed away in your closet. Pull out Aunt Sarah’s silver candlesticks and your grandmother’s crystal bowl, and experiment with adding some shinier elements to your rooms. Want to live in luxury? It’s not about spending money as much as looking at things differently. 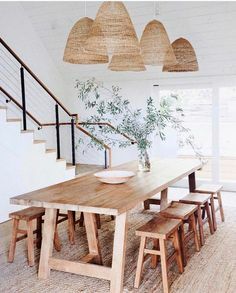 You can make this happen in your home.